Ricky Gervais stars as Dr McPhee in Night at the Museum 3. In the above interview you won’t learn much about the movie. Nonetheless the topics of Ryan Seacrest, Honey Boo and an innovative new TV show are all discussed in another interview between Blanks and Gervais. A winding discussion of banter between two overweight guys wearing ties as his lovely girlfriend looks on! Also big congratulations to Ricky as he got nominated for a Golden Globe Award that morning. 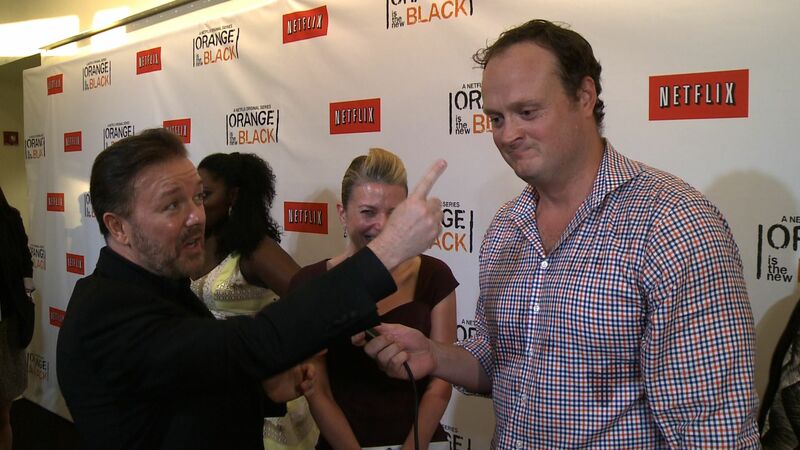 Ricky Gervais has DEREK exclusively on Netflix. I chatted to him at his very own red carpet. I attempt to keep this interview on the straight and narrow but obviously it takes some twists and turns. A hot week in New York City and my assignment was to hit the Bronx. I was in the Botanical Gardens for a big NETFLIX event. 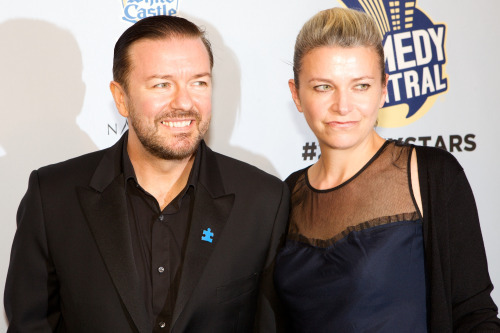 Ricky Gervais has just signed a deal to put his UK show DEREK on Netflix in September. So obviously Ricky had to turn up to see his new employers and say hello. In the following video he spots me waiting to do an interview with him and heckles me about my sweating figure. 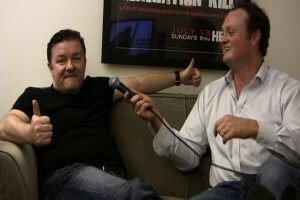 Check out the latest installment in my ongoing interview series with Gervais…. The below interview is when I actually got a few uppercuts in…. In 2006 Comedy Central launched the successful event Night of Too Many Stars. On this night was Ricky’s first ever stand up performance on American soil. I chatted with him before the event on the red carpet as he walked it with his long term girlfriend Jane. 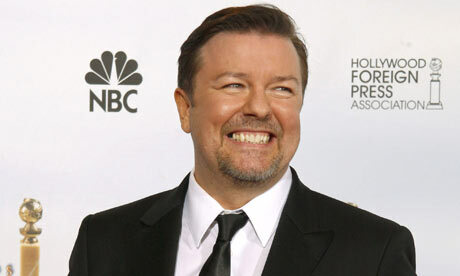 This Sunday night sees Ricky Gervais returning to the stage to host the Golden Globe Awards. This will be his 3rd time hosting where he follows up from a brilliant, yet controversial, performance last year. In honor of Ricky I have delved into the Blanks Archives to pull out the great bits of banter he and I have had over the years. There once was a time on red carpets where I would be the only person interviewing him! Here is a great run-in where he interrupts me doing a piece to camera at the Night at The Museum Premiere, December 2006. The philosophical Ricky Gervais interview? The Ricky Gervais interview I recently did has been said to have some deep insights into the entertainment industry and internet videos! “You have every right to empty your drawers on the internet too” is one of those insights. An interview laced with F-bombs, a sizzling few C-crunchers and a direct hit about being fat. This yarn covered a lot of angles and was simply two blokes catching up for a chat. and here is a moment when I was waiting to chat with him in the HBO building in November 2008! It was a very big and busy red carpet for HBO’s Boardwalk Empire, Second Season. 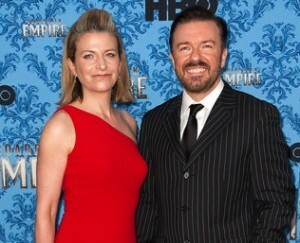 Sauntering cheerfully along the red carpet with his lovely lady was Ricky Gervais. He was in New York City to promote the 10th Anniversary of The Office. In this interview you will learn a few more of Ricky’s insight’s into the world, the internet and my head. 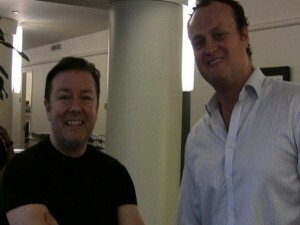 Over the years I have had a lot of fun with Ricky Gervais. For some reason he finds my head weird and at times very topical. This time I got Ricky to talk on the phone so he didn’t lose his train of thought when looking at my head! November 5th Ricky will be performing a the New York Comedy Festival. You can still get tickets to this rare show at Carnegie Hall. October 2nd his movie Invention of Lying comes out starring Jennifer Garner. Have a LISTEN to our in depth interview about stand up comedy and him playing a romantic leading actor. CLICK HERE…..